Is name studies a discipline in its own right? Name studies have been around for a long time. In Ancient Greece, philosophers like Socrates, Plato, and Aristotle saw names as central to the understanding of language, providing key insights into human communication and thought. Still, to the present day, questions such as ‘Are names nouns?’ and ‘Do names have meaning?’ are still hotly debated by scholars within both linguistics and name studies, often in connection with the related question ‘How are names used?’ This is not an issue of theoretical interest alone, but one with important implications for neuroscience. Psychologists have long been aware that names are more difficult to recall than words. A better understanding of their linguistic properties should help to explain why they are processed differently in the brain, which in turn will contribute towards the treatment of brain disorders. In the meantime, different approaches to the study of names have also been developed. For much of the twentieth century, the field was dominated by the question ‘Where do names come from?’ Particularly influential was the English Place-Name Survey, founded in the 1920s by historians and philologists whose primary interests were in evidence for settlement patterns and language history in the Dark Ages. By tracing the origins of the names of ancient settlements and major landscape features, they were able to throw light on population movement during the migration period, settlement patterns during the Early Middle Ages, and lost or partly lost languages. In course of the work, it became apparent that the names of subsequent settlements and smaller landscape features held similar potential for later periods, so the remit of this and other national place-name surveys was gradually extended through the Later Middle Ages to the Early Modern era and beyond. Image credit: No Name Road by NatalieMaynor CC-BY-2.0 via Flickr. 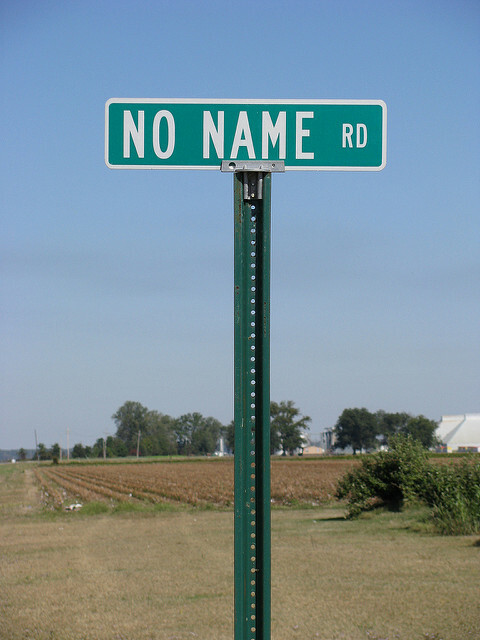 The names of people also originate in different languages and time periods, but whereas surnames, like place-names, are usually descriptive, personal names in most parts of the Western world are not. 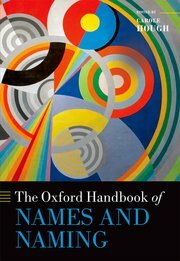 Here, then, the major questions are ‘Why are names chosen?’ and ‘How do names reflect society?’ Since personal names are bestowed afresh on each generation, there is more scope for deliberate choice, so the personal name stock can function as an index of changing values on a societal level. So too do the names of commercial products, one of the various types of names to be regulated by law. In a move away from an exclusive focus on etymology, similar questions are now being asked of place-names. Language varieties within the namescapes of multi-lingual urban environments are used to explore community identity, while the Glasgow-based Cognitive Toponymy project takes the relationship between descriptive names and human cognition as a starting-point to investigate how people conceptualize place in Western Europe. It should be clear by now that there are many branches of name studies, including name theory, place-name studies, personal name studies, names in literature, and names in society, and that the field itself is interdisciplinary, relating closely to such disciplines as archaeology, geography, history, linguistics, literature, philology, philosophy, psychology and social science. One question remains. Is name studies a discipline in its own right? A growing number of universities in various countries offer courses on name studies, but I know of no degree programme on the topic. It is possible to study names as part of a degree, but not to be awarded a degree in name studies. Is it time for that to change? Featured image credit: Enough with the names already by James Cridland. CC-BY 2.0 via Flickr. Carole Hough is Professor of Onomastics at the University of Glasgow, and editor of The Oxford Handbook of Names and Naming (2016). A former President of the International Council of Onomastic Sciences and Convener of the Scottish Place-Name Society, she is currently Vice-President of the Society for Name Studies in Britain and Ireland and a Council member of the English Place-Name Society. She is also Principal Investigator for two major research projects: Cognitive Toponymy: people and places in synergy, funded by the Royal Society of Edinburgh (2014–2016), and Recovering the Earliest English Language in Scotland: evidence from place-names, funded by The Leverhulme Trust (2016-2018). This topic needs a very deep knowledge . I also used to find my ancestors name and from where it originated . My grandfather name was Abraham. I founded his name meaning,origin,history and even numerology numbers on this website called Babynology .